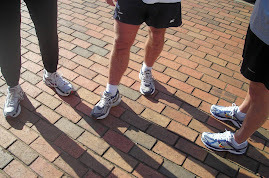 The 27th running of the Cookie Dash 5k (formerly called the Re-Creation Run) was Saturday, April 17, 2010. This is a well established race that always has a good turnout. This year was no exception. The race filled up and closed its registration earlier this week. This is not a fast course by any definition. It has two cone turn-arounds and one cul-de-sac turn around. That's a lot of turning in a 5k! Also, this race is rolling and has a significant uphill start. It's a rare 5k course that has many runners running the 1st mile as their slowest. The overall winner was Brandon York of Huntsville in 15:47. The female overall winner was Limestone County's own Whitney Hollingsworth of Elkmont in 21:43. The masters winner was David Purinton in 17:36. The female masters winner was Roberta Hauck of Madison in 22:02. The overall results, age group results, and awards are available at the HTC website. I missed a race last weekend. The annual Mule Kick 5k was held in Columbia, TN on April 3, 2010. This race normally coincides with the annual Mule Day festival in Columbia, but the events were shuffled around this year due to the Easter holiday. The overall winner was David Hudson of White Bluff, TN in 17:03. The female winner was Rebecca Severe of Columbia, TN in 22:05. The masters winner was John Lovell of Brentwood, TN in 18:56. The female masters winner was Stephanie Robinette of Mt. Pleasant, TN in 23:33. Full results are available here. Visit the Mule Kick 5k website for more information. There were 3 Limestone County finishers in the 5k. Limestone County finishers in the 1 mile included Morgan Bonner and Garrett Bonner of Ardmore. The annual River City Run was held in Point Mallard Park in Decatur on Saturday, April 10, 2010. This is a long standing race in the area that always draws the top talent in North Alabama. This is the best chance for a 10k PR in the spring in North Alabama. There aren't many 10k races in this area, and the other 10k races are on notoriously difficult courses. There was a strong turnout at the River City Run this year. This years number exceeded last year's number when the River City 10k hosted the Alabama 10k State Championship. The official results are on the River City Runners web site. The 10k winner was Hirbo Hirbo in 33:21. The female winner was Emily Hardin in 36:55. The masters winner was George DeWitt in 34:56. The female masters winner was Theresa Ball in 42:47. The 5k winner was Eric Fritz in 20:12. The female winner was Lisa Hamn in 25:00. The Limestone County finishers are listed below. The only Limestone County finisher in this race was Mark York of Ardmore in 25:11.